In our modern world today this energy lives on in certain geographic places such as Napa Valley where I have been living for awhile now. The drive up the valley floor brings bucolic vista after vista of grape vineyards glowing like a green sea while the purple hillsides are doted with villas, castles, and old Victorian mansions now converted into wineries. The little town of St Helena is picture perfect with its manicured yards where roses and jasmine scent the air with intoxicating fragrance. The local shops are primarily high-end jewelry and dress boutiques, like ‘Shoe Candy’, gourmet chocolates, and art galleries, all catering to the well-heeled couples who come here for wine, shopping, fine dining, and romps between the sheets of $500 per night royal-inn boudoirs. The Culinary Institute has its West Coast home here in the old converted Christian Brothers Winery. This valley is an epicure’s heaven with famous restaurants like ‘The French Laundry’ and “Mustards’. This is a place for the Taurus ‘Good Life’, available to any and all willing to shell out a few thousand for a weekend of sensual delights. Taurus is a Fixed Earth sign whose ruler is Venus. The Moon is exalted in Taurus thus making it a double Feminine or Yin sign. Taurus rules the mouth, neck, esophagus, throat, and shoulders, of the body. The thyroid gland is important here. The qualities of Taurus are fertility, conservation of resources, building, sustaining organic life, and stabilization. The great strengths of Taurus are stamina, perseverance, endurance, loyalty and sensuality. Taurus is the practical realist whose need is to get things firmly established. Taurus types can stay calm in the face of turbulence and lend order, stability, and security to their world. The Shadow of Taurus is when the stability of this strong sensate type gives way to extreme obstinacy. Rigid ideas and fixed opinions create the stubbornness and intolerance that holds Taurus back from empathetic resonance with others. Being Bull-headed, bullish, or bullying stem from these more negative traits. The incapacity to change, possessiveness, and strong resentments can impede the evolution of these types. In our hemisphere north of the equator, Taurus is the time of the year from April 21st until May 21st when the fiery energy of Aries is harnessed and grounded more fully into the earth. The glyph of Taurus shows clearly the wheel or circle of life containing the solar energy surmounted by the crescent moon, rising above like a chalice. One is also reminded of the horns of a bull in this image. 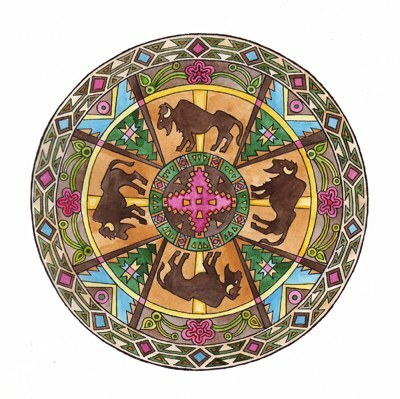 The bull epitomizes many of the qualities of Taurus: fertility, strength, strongly connected with the earth, placid and content until prodded or goaded. Ferdinand the Bull in his daisy patch can easily become the raging bull if stung by a bee! The constellation of Taurus, as defined by the ancient Sumerians was composed of the front quarters of the bull only. In the myth, Inanna, Goddess of Fertility, was said to have torn off the hindquarters. Within this constellation are a plethora of major stars and celestial wonders. The Pleiades are here with Aldebaran, the bull’s eye, as part of this very loved and honored star system. The Moon, said to be exalted in Taurus at 29 degrees, is exactly where the Pleiads are located in our present-day tropical zodiac. Alcyone, the brightest star in this system, considered the galaxy’s Grand Central Sun, is associated with the power of abundance and attraction held in this Fixed Earth sign where Alcyone exerts a strongly consistent pull on our own Sun and the planets orbiting in our own solar system. Orion, the Hunter, is also within the constellation of Taurus. Is it any wonder then that Taurus has more myths connected with it than any other sign in the zodiac? The Age of Taurus, taking place in the 3rd and 4th millennia B.C., was a period when natural fertility was deified. This was the period when the Sumerican and Egyptian civilizations were beginning to take shape. The Minoan civilization of Crete reached its first peak during this era, and Stonehenge and the other great stone circles of the Celtic world were being built. The ancient temples of India bear witness to the worship of Nandi the Bull, later to be known as the male divinity, Lord Shiva, who was consort of Sati, goddess of married love and loyalty. It was a matriarchal era in which worship of the bull was paramount. The Goddess, the Moon, and the Bull were all inseparable symbols of fertility and abundance. The Babylonian epic of Gilgamesh describes Ishtar, Goddess of love and battle, sending a bull against him. Gilgamesh was symbolic of the advancing patriarchy and a strident enemy of the Great Goddess. The Greeks told a myth of the abduction of the lovely maiden, Europa, daughter of the King of Phoenicia by Zeus, that incurable philanderer God. He had disguised himself this time as a bull and carried her over the Mediterranean to the island of Crete. There he mated with her and fathered the children of Cretan’s royal house, whose later descendants came to be known as ‘Europeans’. The Romans had their bull-cult centering on Mithras as bull-slayer. Again, sacrifice of the sacred bull meant that fertility would be ensured, but the Mithraic zodiac religion was more sophisticated than that with its sacred rites and series of initiations designed to take the initiate from the realm of matter to the ultimate realm of spirit. King Minos and the Minotaur is perhaps the best known of these bull myths. This Greek myth tells the story of the gift of a rare white bull given to King Minos from Poseidon, the Neptunian god, with the directive to sacrifice the animal to ensure the continuation of fertility on earth. Minos gave in to the shadow side of Taurus, which is covetousness and greed, and kept the bull for himself. This selfish act caused great tragedy including the loss of his beloved wife, Pasiphae, to her crazed lustful desire for the bull, which in turn brought forth the aberrant offspring, Minotaur, who was half-man, half-beast craving only human flesh to satisfy his hunger. This is truly a tale of sensuality and desire gone amuck. 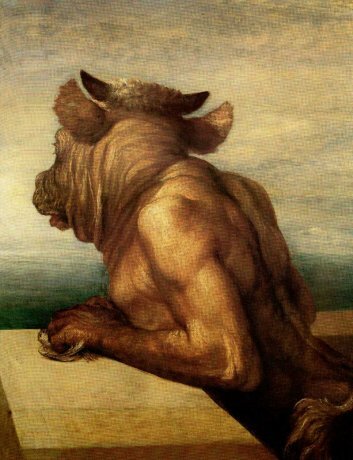 The master builder, Daedalus, another Taurean archetypal figure, crafted the elaborate labyrinth for the Minotaur, but fell prey to the other shadow aspect of Taurus which is the penchant to become entrapped in one’s achievements or possessions. Taurus often tries to civilize and contain the baser instinctual side of its nature by relegating it into the unconscious where it often turns dysfunctional and pathological. The redemptive Taurean female, Ariadne, saves the day by becoming the guiding light for the hero, Theseus, who follows her golden thread out of the labyrinth after slaying the Minotaur. She represents the beauty of inspiration which is also a Taurean trait connected with love and creativity that awakens the heroic within. Taurus, once it gets past the inertia of staying content with its comforts or the tendency to take care of everyone else’s basic needs first, can be an incredibly creative force. Venus is the ruler of this Fixed Earth sign, and her light shines forth with great artistic flair in the world of arts, design, and fashion. That creative force can be as diverse and rich as the outpouring of one of the world’s greatest master storytellers, Taurean William Shakespeare. His love of the senses shines through every drama and tale but perhaps nowhere so profusely as Midsummer’s Night’s Dream, a veritable feast of sensuality. Modern-day Al Pacino, the actor, is another famous Taurus who has shown prolific talent and enduring stability within his craft. At 67 he is now working in theater and crafting a new film based on Shakespeare’s works. Some of his more famous roles depict the highs and lows of Taurus. Scarface certainly shows the ascent into ‘the good life’ and the final plunging descent due to excess. Scent of a Woman, on the other hand, shows that even after life deals its hard knocks, the light of Venus can breath new life into what has become rigid and obstinate. In esoteric thought the ‘taming of the bull’ is akin to the subduing of the desires and thoughts that keep one chained to the endless repetition of patterns. 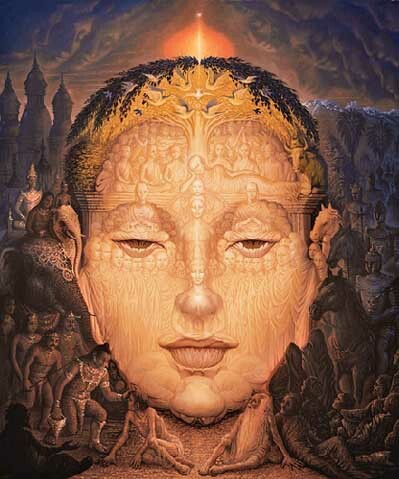 Gautama the Buddha brought a new teaching during the second millennium B.C. that slowly challenged The Age of Taurus and its adherence to attachment to form. The Buddha, tradition says, was born on the Full Moon in Taurus, reached illumination, and died on the same Full Moon. The story of Siddhartha is archetypal as we follow the prince, born into wealth and privilege, journey to a final place of detachment from all things that bind one to the earthly plane. Reaching illumination for the Buddha was not a question of outside intercession nor liberation, but a path available to all willing to persevere and be diligent in their own practice of positive and deliberate willingness to detach by bringing total awareness to each moment. The Buddha was quite the practical realist and technologist in his methodology and approach. Very Taurean! Therein lies the great spiritual gift of Taurus: to sit in stillness with the Buddha-self at the foot of the Bodhi Tree and enjoy the condition of Nirvana, which is free and available to all if one is willing to persevere. Thank you for a very informative and interesting post on Taurus. I’ve learned a lot! I drove a taurus, does that count? I’m a Taurus girl myself. And plus, I’m Buddhist too. Thanks for the post. I’ve learned a lot about the history and myths regarding Taurus. hoping my Taurus rising may bestow the benefits of this interesting sign. Oh, and you Taurus girls are beautiful, with a sensual glow to your countenances! If your Rising sign is Taurus, then esoterically you are said to be a Taurus Soul! The Sun sign is what your Soul needs to develop in just one incarnation according to this philosophy. Yes, a lot of substantial men and women have been and are Taurus. Have you heard of or do you know of fellow astrologers using astrology with stock brokers on Wall Street??? Yes, of course. There are many of them. Raymond Merriman is one. William Stickevers another. I’ll have to find my list later at home as I’m just now on vacation. Good question! Hello! My name is Sochima, am a student of University of Nigeria Nsukka. Am very happy because it’s really nice to meet people with the same star sign like mine, ”Taurus” it’s really nice am very happy. To view more about my school please click on the link http://www.unn.edu.ng//Thanks..
Just want to hear any commentary or opinions you might have on the Taurus ascendant in general, and perhaps when it is joined with a water sun and air moon. The Taurus approach may be too slow for the Airy Moon, but quite the container for the watery Sun. Taurus is the salt of the Earth and is drawn towards stability and productivity. Because it is a fixed sign it needs reality to be solid, strong, and safe and to be seen as such a person. Taurus is a highly attractive sign, so magnetism is great, especially with a watery Sun. Look to your Venus and its placement to get a handle on where your Soul wants to go and what brings the greatest value to you in this life. P—That’s a lovely combination! And a real plus for a modern man! P—Yes, absolutely, plus the exercise of great compassion. Venus in Pisces is exalted there—-the higher octave place!